Quick overview The Thermaltake SP-1200M satisfies your power-hungry virtual instincts and keeps you running at your best. The PSU is ready for SLI or CrossFire configurations, with six 6+2Pin PCI-E connectors. Robust and dedicated dual +12V outputs provide superior performance under all types of system loading. 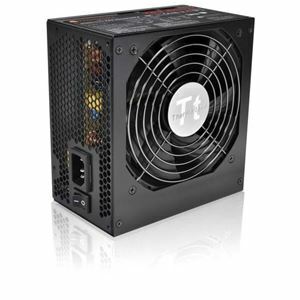 Keeping it cool is a 135mm fan with RPM control. With its 80 PLUS BRONZE certification, less energy is wasted as heat or interference, delivering more power to your hungry system!